Learning to manage your own health has become something of a mantra since the turn of the century. After decades of patients waiting until something went seriously wrong before approaching a doctor or visiting the ER, people were finally being urged to look after and monitor their own health. Collectively, we have been encouraged to eat right, get exercise, and avoid unhealthy habits like smoking and drinking too much. Some have taken this self-preventative approach to health one step farther and entered the domain of vital sign monitoring. Previously the exclusive responsibility of doctors and other health care professionals, people now monitor their own blood sugar, heart rate, sleep patterns, allergic reactions, and any of the other 15 or so vital signs that can give clues about the state of one’s health. Does all this vital sign monitoring benefit anyone over the long term? According to recent research, the answer is “yes,” especially when it comes to measuring blood pressure. A research team from Minnesota recruited 450 people with hypertension. The patients were divided into two groups. One group was given home blood pressure monitors, while the other group received usual care from their doctors. The home blood pressure group was linked to a web site. Each participant was asked to send six blood pressure readings a week to the web site. Pharmacists then looked at the readings and made recommendations based on their findings. These recommendations included altering medications and suggesting lifestyle changes. This collaborative approach was much more successful in getting blood pressure readings under control than the usual care approach. Almost three-quarters of the home monitoring group lowered their high blood pressure readings compared to only about half in the usual care group. The researchers think that seeing blood pressure readings that are too high first-hand—without a doctor around—was a great motivating force to get to work on controlling blood pressure. And too, the research team pointed out, it’s a real boost when a patient works to make lifestyle changes and sees the results when blood pressure readings drop closer to the normal range. Want to get on the self-monitoring program for high blood pressure? Here are four common mistakes to avoid when taking blood pressure readings at home. To get accurate readings, technique does matter! Don’t put the cuff over a shirt or blouse. This will affect the reading. Do put the blood pressure cuff around your bare skin about an inch above the crook of your elbow. Don’t take a reading with your arm dangling at your side. Do sit in a chair and rest your arm (with your elbow bent) at about heart level. Don’t talk during your blood pressure reading or engage in any activity—even doing a crossword. Do sit still and relax. For those with white coat hypertension, reading a set of instructions (or some equally non-arousing text) while sitting still in a chair can help keep your mind and body relaxed and focused on something other than the blood pressure test. Don’t keep your blood pressure readings to yourself—especially if you are worried about them. Do share them with your doctor or healthcare provider so that any concerns can be immediately addressed. Checking your blood pressure at home is an easy way to stay on top of your health, but make sure to avoid these four common mistakes to get the most accurate results. Margolis, K.L., et al., “Effect of home blood pressure telemonitoring and pharmacist management on blood pressure control: a cluster randomized clinical trial,” JAMA. July 3, 2013; 310(1): 46-56. 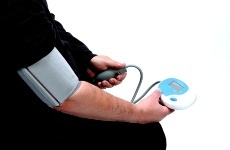 Magid, D.J., et al., “Home blood pressure monitoring: take it to the bank,” JAMA. July 2013; 310(1): 40-1. Godman, H., “Checking blood pressure at home pays off,” Harvard Health Publications website, July 3, 2013; www.harvard.health.edu, last accessed July 8, 2013.